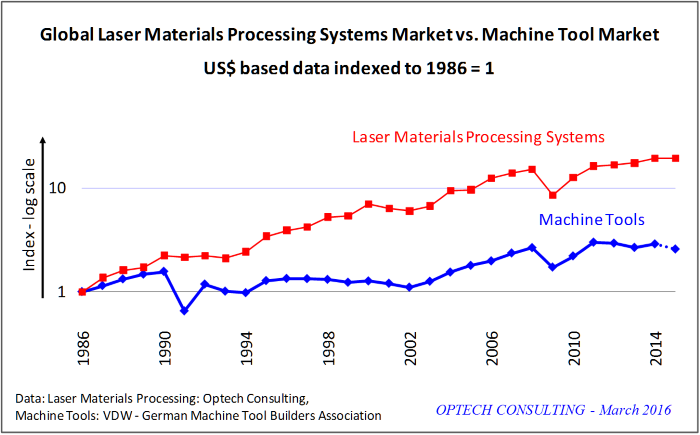 Taegerwilen, Switzerland, Mach 17, 2016 - - Global sales of laser systems for materials processing increased by 10% in 2015 versus the previous year measured in local currencies, according to the annual market survey conducted by Optech Consulting. In US-dollars, the increase was wiped out completely, and the market volume came in at US$11.8 billion, level with 2014. Measured in euros, the market increased by 20% to €10.7 billion, up from €8.7 billion in 2014. Market growth rates in local currencies of ten and more percent were recorded for Europe, North America, Japan, and Korea. Sales in China increased by nearly 5%, with weakening demand towards the end of the year. Due to the shift of currency exchange rates China surpassed Europe as the world's largest consumer of industrial laser systems for the first time in history, in spite of the comparably low growth rate for the Chinese market. Within Europe, the recently much battered markets in Spain and France lead market growth, followed by Italy and the UK. Germany, which lead growth in Europe in the recent years, accounted for a low single-digit increase. Demand in Eastern Europe was mixed, with a strong increase for the Czech Republic, and a weaker market trend for Poland and Hungary. High power laser systems for cutting, welding and surface treatment account for a 45% share of the market. 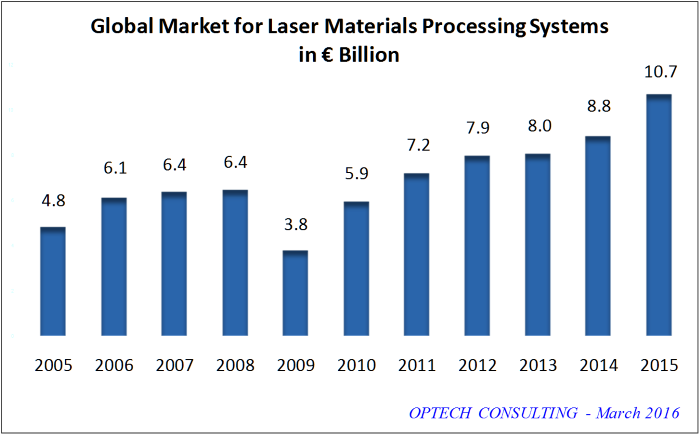 Laser systems for microelectronics processing make up for a good 20% share. These systems are used in the manufacturing of a wide range of products, including semiconductors, flat panel displays, printed circuit boards, solar cells, fiber-optic components, and microfluidic devices. The balance of about 25% is accounted for by other low and medium power laser materials processing systems. This includes systems for metal and non-metal cutting, welding, marking, additive manufacturing, as well as many other processes such as cleaning, engraving, and soldering. Especially additive manufacturing and medium power metal cutting systems spurred growth in the low and medium power segment in recent years. The majority of the laser materials processing systems are used in machine tool applications such as cutting, drilling and marking. Hence, the machine tool market can be used as a benchmark for comparing the laser systems market against. In 2015, the global machine tool market increased by 7% in euros - corresponding to a decrease by 11% in US-dollars - according to a preliminary analysis of the German Machine Tool Builders Association (VDW). At the same time, the market for industrial laser systems increased by 20% in euros, corresponding to a sideward movement in US-dollars. Also for the previous three years the laser systems grew stronger than the machine tool market, indicating that laser processes gain ground. 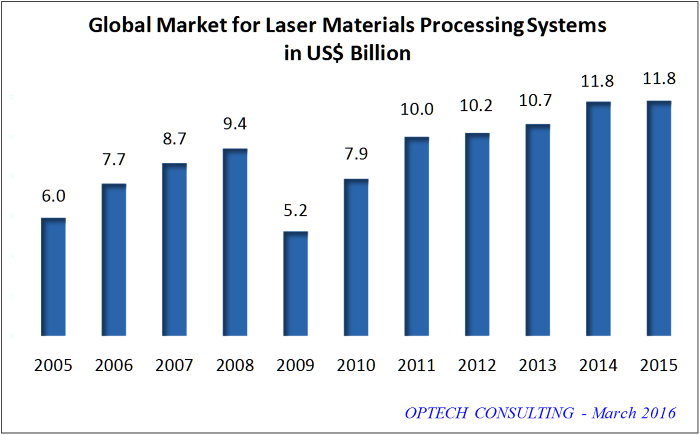 For 2016 Optech Consulting expects a sideward trending demand for laser materials processing systems, worldwide. The expectation follows sales and order booking for industrial lasers and laser systems as well as for machine tools and electronic manufacturing equipment.